Last edited by VilleK on Tue May 26, 2009 1:48 pm, edited 1 time in total. Synched Is it possible to add members without source write permission for the time being to make use of Google Code's Wiki & Milestone features? Kjell, it seems like user permissions for source and wiki are the same because the wiki-pages also gets checked into the project root according to the Google Code FAQ. But I can give you those permissions anyway because I trust you wouldn't check in any code without my approval. Do you have a Google Account? I think this is needed. VilleK wrote: Kjell, it seems like user permissions for source and wiki are the same because the wiki-pages also gets checked into the project root according to the Google Code FAQ. But I can give you those permissions anyway because I trust you wouldn't check in any code without my approval. Do you have a Google Account? I think this is needed. 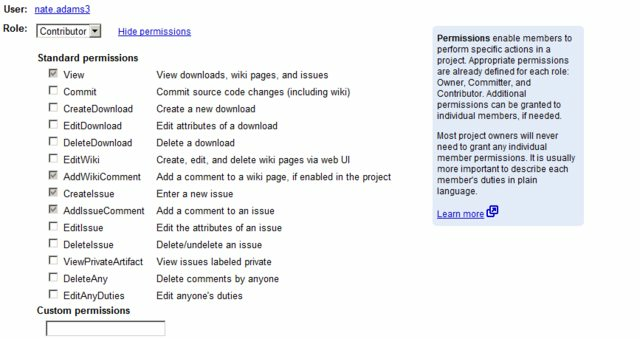 If you go to Project Home -> People and then Add a Member as a "Contributor" you can then click on that user and set granular permissions such as ability to edit wiki (editing from the web UI) and issue management without giving people access to code. I would like to second enabling the issue tracker - I believe when someone edits code it will submit their change as a ticket. Personally I want to do this, as well as adding stuff to the wiki (though I don't have much to contribute yet, I can help start organizing information). Edit: I keep forgetting that http://zgameeditor.org/ is running a wiki. Since you have that I can't think of a good reason to enable wiki on Google Code, one reason perhaps without having to worry about credentials (as editing on the google code wiki editing uses your google account). Thanks, I did not know about those detailed permissions. I've turned issue tracking on again. I can give you permissions if you pm me which account you want to use (I noticed you got several). ZGE source code has now been moved to Github because Google Code is shutting down. Updated first post in this thread with new URL.